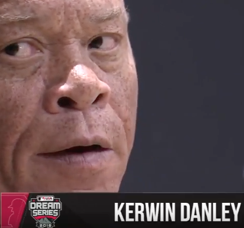 Spring Training 2018 has produced a nearly unprecedented level of umpire interviews, with Kerwin Danley a featured speaker at MLB's Dream Series, and local profiles of Mike Muchlinski in Arizona and Tim Timmons in Florida. 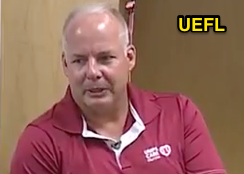 Meanwhile, Ted Barrett sat down for an extended conversation about new rules and replay. It's the pitching coaches first. Hitting coaches, you don't hear from them that much, unless...you're having a bad day, then you hear from them. The data support Danley's observation: just two hitting coaches were ejected in 2017, compared to seven pitching coaches. MLB Umpire Mike Muchlinski is in Arizona. Mike Muchlinski: Cincinnati, Ohio's WCPO-TV shadowed Muchlinski during a day at Goodyear Ballpark, the Reds' and Indians' shared-use stadium in Arizona's Cactus League, discussing his path to the major leagues and how umpires prepare for the regular season, including enforcement new rules, rotation between the bases, and the rigors of spending months away from home and family. A brief glimpse of Muchlinski and Adam Hamari discussing what is and isn't a mound visit appears as well. We prepare every day to get every call right. Realistically, that's not going to happen, so it's a good thing to be able to fix the big errors, especially when it comes to a decision that affects the outcome of a game. MLB Umpire Tim Timmons is in Florida. Tim Timmons: In Florida, local station WFTX joined Tim Timmons at Jet Blue Park to get the Grapefruit League perspective. Like Muchlinski, Timmons described his journey to the big leagues and recounted the story of his first interaction with Hank Aaron, who told a group of aspiring minor league umpires, "If you give to this game, it will repay you ten-fold." Explained Timmons concerning the villainy of the umpire, "the jeers pay the bills." As Muchlinski stated in Arizona, the downside of professional umpiring is the time spent away from family. MLB Umpire Ted Barrett is in Arizona. Ted Barrett: Fresh off his in-game interview with Angels baseball, veteran crew chief Ted Barrett sat down with ESPN to discuss MLB's new mound visit limit, replay, technology, and fan perception. Related Post: Spring Feature - Ted Barrett Interviewed During Game (3/16/18). Barrett foresees that MLB will tie up any loose ends concerning mound visits by Opening Day. For example, when a catcher took a foul ball off his mask in late February, the plate umpire charged the defensive team with a mound visit because the pitcher had walked to home plate to check on his battery mate. Although MLB still hasn't formally addressed that specific play, the League has issued clarification that a catcher visiting the mound to buy an injured umpire some time after a similar foul ball situation would not be deemed a mound visit. Related Post: So it Begins - Mound Visit Charged on Injury Timeout (2/27/18). Regarding replay, Barrett likened having a call of his overturned to that of a batter striking out: "Anytime you fail, that's tough. You have to get over it. And it's not just when the game is on the line: I would feel bad if I cost a guy a base hit." Certain strike zone plots can be misleading. In admitting he has never called a catcher for blocking the plate in real-time, a trend that holds true for every big league umpire—MLB has yet to experience an umpire calling a blocking-the-plate violation in real-time...such a play was only overturned from "no violation" to "violation" via replay, thus scoring a run, once out of 13 total reviews in 2017, and that was during the postseason, resulting in an ejection—Barrett explained that such a call is difficult to see in real time. 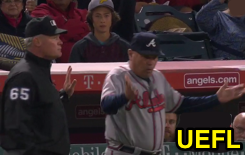 Related Post: MLB Ejection P-2 - Mike Winters (2; Joe Maddon) (10/14/17). If it's blatant, I'll call it. Otherwise, replay will do the overturning. Improved technology has also led to electronic (albeit faulty) ball/strike calculations, which have most popularly spawned a series of statistical umpire rankings, although the tech used from one system to the next may not be consistent (nor accurate). Instead, Barrett relies on the innovation to help with reviewing technique, such as positioning or stance consideration: "It's a never-ending self-analysis." 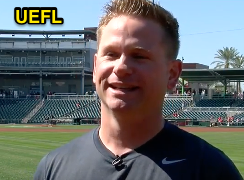 Finally, Barrett discussed fans, how he generally tunes them out, and how the World Umpires Association turned to Twitter (@MLBaseballUmps) to try and get the umpires' viewpoint out into a world that hasn't always allowed sports officials to speak up. For instance, the WUA used the account to communicate the circumstances surrounding its white wristband protest of escalating verbal attacks and the Commissioner's deficient response to such unsportsmanlike acts during the 2017 season. The protest lasted all of one day before Commissioner Rob Manfred agreed to meet with the umpires. Barrett serves on the WUA Governing Board. That's the biggest thing I want to get across to people that say, "Big league umpires have no accountability." Every play and pitch we call is analyzed. We get reviewed on everything. It's not always public, just like internal things with players and teams aren't always public. We make every effort to be at our best. Link: Ted Barrett Interview with ESPN (3/20/18).